Please do NOT block bay doors. Please park in the designated parking areas that are outlined with white striping. Additional parking can be found behind the building. Once you are safely parked please bring your DMV renewal notice or registration card with this coupon into the office. Please print out this coupon. This coupon can not be combined with any other offer. 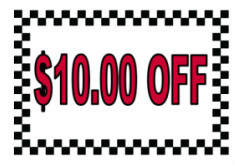 If you use this discount you will NOT receive a FREE Re-Test if your vehicle fails the smog inspection. This must be presented before service is received. You MUST print this out. No discounts will be given for electronic images. No cash value. If you are not 100% clear on our policy regarding discounts please call us anytime.